If you use Hashtags, your posts on Instagram will be seen by a wider audience than your followers. To spread your content in the right places you have to use the hashtags of your specific niche. You can easily find out which hashtags are the most successful in your industry by analyzing your competitors with Fanpage Karma. The first thing you should do is create a dashboard that contains all of the profiles of your competition on Instagram. Don’t forget to add profiles of products next to the company profiles as well. This is how you create a dashboard. If you were in the chocolate business, for example, you could add Hersheys, Lindt and Reeses and also Twix, Toblerone and Kinder Bueno. Tip: Type in a word into the hashtag search on Instagram to see which profiles are using it. It may be that you will find interesting profiles you didn’t know about yet. You can then add them to your dashboard. When your dashboard is done you can start analyzing. In the analysis section, you will find a graph that displays the most frequently used Hashtags. It shows which hashtags were used most often by the profiles in the set time period. The bigger the font size, the more often a hashtag was used. The greener, the more reactions were given to posts with that hashtag. In the chocolate branch hashtags like #brownie, #whitechocolate or #chocolate were successful. Posts with the hashtags #chocolatelover, #recipes or #chocolatechip didn’t get as many interactions. By changing the time frame of your analysis you can assess how the success of hashtags differs at different times. A click on a hashtag in the graph takes you to the Instagram search. Here you can see how often it was used all in all. Maybe you want to follow the hashtag to keep up to date. Now that you found out the most successful hashtags of your industry you can benefit from them yourself. To get the biggest reach, however, you probably need some more. Our study on how many Hashtags you should use on Instagram tells you exactly how many hashtags you should use for different purposes. Our Hashtag Composer will generate the hashtags that you are still missing for you. Type in the hashtags that you already found out. The composer then offers you a list of fitting and relevant hashtags. You can pick and choose the ones you like and copy the whole list to your Instagram Post. 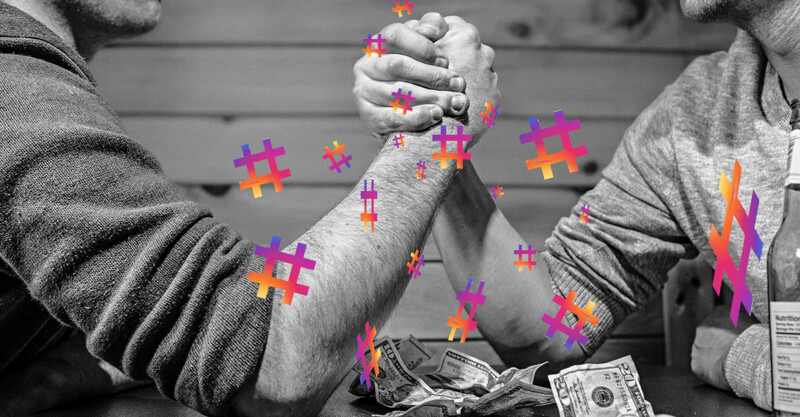 Do you want to find out which hashtags your competition is successfully using? You can now try out all analyses together with your team.